You are correct to be wary of downloading certain freeware "solutions" for spyware, viruses and popups. There are some excellent free anti-malware tools, but some of the freebies circulating in cyberspace are in fact rogue programs designed to open your computer to a massive invasion of spyware and viruses. One notorious example was Winfixer, which purported to fix all manner of ills on your Windows PC. More recent examples include fakes with names like Antivirus 2013, and Win 7 AntiSpyware. In reality, these fake anti-virus tools are "malware funnels" that only makes things worse. If you get tricked into downloading one of these, you'll probably see popups everywhere, and new viruses coming in by the truckload. 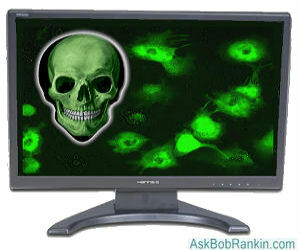 See my related articles Fake AntiVirus Software and Don't Fall Victim to Scareware for more on that. I hear from some readers who run two or three anti-virus programs, and half a dozen anti-spyware tools. Personally, I think that's overkill. WAY overkill. In fact, anti-virus programs can end up fighting with each other, and cause system lockups. And running multiple anti-spyware tools at once WILL slow down your computer. There are at least a dozen highly touted anti-virus and anti-spyware tools -- some commercial and some free. So I understand your confusion as to which ones are best for you. It's natural to assume that the paid-for variety is of higher quality, but that's not always the case. I'm also impressed with Bitdefender Antivirus and Avira, both of which are excellent free anti-virus tools. If you dump the costly resource-hogging Norton or McAfee anti-virus for any of these alternatives, you'll be VERY happy that you did. The free version of MalwareBytes Anti-Malware tool does a great job of scanning your system for spyware and removing infections, especially in situations where something may have slipped past your first line of defense. See also Five Free Malware Removal Tools for some additional tools you can use to reinforce your security defenses. Another critical, but often overlooked piece of the computer security puzzle, is your application software. In Computer Security: The Missing Link, you'll find tips and free tools to help you keep all your software up to date with the latest security fixes. This is what works for me. They're all free, they all come from trusted sources, and they work great. Automatic updates in each program help them keep pace with changes in the malware universe, and I have to say the proof is in the pudding. I do a LOT of web surfing, downloading and email handling. And so far, so good! That's not to say that the commercial internet security tools are worthless -- far from it. Typically they include a suite of programs that includes anti-virus, anti-spyware, firewall, spam filtering, download scanner, vulnerability detection and other features. All of the components will have been tested to work well together, and have a common user interface. You can get the same protection by using a combination of tools as I've described above, but keep in mind that technical support is not included with the free anti-virus programs. If you want an all-in-one solution, comprehensive protection, and technical support, paying $60 to $80 every year for the additional peace of mind may be worth it. Most recent comments on "Should You BUY Anti-Virus and Anti-Spyware Software?" I have used AVG in the past at home and at work. The work computers got hit with a virus which caused me to drop using it and buy a commercial software (Eset AV). I have used Kaspersky AV on my laptop. Maybe this was just our experience but since then, I don't trust the free stuff to be robust enough in a corporate environment. Unfortunately, the last time I checked you could only download AVG Free through cnet.com - a once reliable software source which is now a prime provider of "pushware" and other unwanted programs. I no longer trust the only source, and don't download this (or any) program through cnet. So AVG Free loses more potential customers. I do IT work and maintain other people's computers, and no longer install AVG Free there either. What about Mac? Most Mac guys I talk to say you don't need to worry about virus software on a Mac. Being both a PC and a Mac guy now, I'm very hesitant about that. I do practice safe computing (not clicking strange links etc) but I still have to wonder. If there was a silent virus on a Mac how would you know? I wonder what Mac anti-virus is recommended? I was a staunch advocate of Microsoft Security Essentials (MSE) until recently when the software kept acting up in a consistent basis. So now I have Panda Cloud installed and use it on an as-needed-basis to scan my computer system. The developer is a Cool guy (named Roger) who DOES respond to e-mail sent to him! FreeFixer was the only thing that was able to identify a Super Trojan in my computer which I was was able to TAKE OUT with the use of my Linux CD live disc. A note to Dan; AVG can be downloaded from FileHippo.com without the down loader program and all of the garbage that cnet tries to force on every one now. i used them all like others..but the last 4-5 years,i have not used anything.My ISP provides somekind of protection,but i use no antivirus spyware etc at all..if you stay away from music sites and game sights(no more kids), i have no troubles..just a waste of time in my opinion..
Another worthy topic, Mr. Bob Rankin. And another exemplary in-depth analysis that is worth every milligram of effort you must have put into it. Over the decades of computing (in primarily WinOS camp) and having used many different FREEware AV software available; one thing that I can summarize from your worthy inputs is that the land-scape of malware continue to change with newer threats that seem to arise almost monthly. And as you have discussed, there needs to be a vigilante effort for continual (=at least yearly) evaluation of every user’s current AV protection. As you have done with switching from AVG to Avast, all users who value their data need to re-evaluate their AV protection yearly. Over the past decade+, I have watched as the “best” AV crown has been awarded to different companies! In addition, there are a variety of dedicated websites for comparative testing of available AV software. In fact, it is sometimes difficult to determine which one of these AV test websites are truly legitimate (and impartial/independent) efforts or just self-serving fronts that may possibly be owned by some of the AV companies vying for the “best” title! Protection of one’s data should never solely rely on AV software but should be a combination of such software along with periodic back-up (and offloading) of such user data from possible damage/loss/compromise! Please add my vote for the awesome ESET Smart Security product. With ESET you get very frequent signature updates, an easy to use user interface, and compact code that does not slow your computer. It is available in a previous "3 user" version at a discounted price when a new version is released - and ESET will let you upgrade to the latest version at no extra cost. It has achieved a recent very high rating by Consumer Reports and does an excellent job of protecting your computers. Thanks Bob for all the good work you do to help others. Your Newsletter is one of the 3 sources of info I trust for both integrity and competence. The others are Gizmos' Freeware and Fred Langa who I followed to Windows Secrets. I combine the info from these sources to get a "consensus" on any subject. From the above sources I use the following Utilities to protect my computers. Avast antivirus, Comodo Free Firewall, Malwarebytes (free) & Malwarebytes anti exploit (also free), Sophos Anti-Rootkit, Start Up Monitor. I recently installed Crypto Prevent (to help stop CryptoLocker malware). I use Firefox to browse because of the excellent Add-ons you can use to further protect your surfing. I turn on "No Script" when I am going to surf sites that are not among the Sites you know you can trust. I installed WOT (Web of Trust). For Maintenance, Cleanup & Fix errors I use Jv16 Power Tools (Pay Version), CC Cleaner (free), PrivaZer (also Free). I recently installed PrivaZer and used it's "Clean Free Space" feature & it solved the problem I had with an external drive that kept freezing my computer when I tried to use it. I've gone way more that 10 years without any crippling events using the above programs. I hope some of you find this info useful. Thanks Ray. @jenny Price. It would be hard to answer what happened to your office without visiting your computer. First I'd search your computer for office. If office was installed in another another partition separate from your operating system. (Any office work would be protected if office was on another partition and work was kept there). It can be restored by reinstalling office. If a search on all of your hard drive(s) turns up nothing, you most likely don't have office. When a new operating system is installed everything usually is wiped from that drive partition to make a clean install. Hope you understand this and it helps. I am also using Avast AV (free) along with MalwareBytes (for a "second opinion scan). In addition, I also use KeyScrambler Pro from QFX Software that is supposed to scramble (encrypt) key strokes and such in real time. I also have Kaspersky's TDSSKiller (an anti-rootkit utility) that I can run if need be. All these are free with the exception of KeyScrambler Pro. While I feel MBAM is a great freeware tool, not enough users complete full scans regularly nor does it have "Real Time" protection. When I eradicate viruses from a user's machine, I pretty much require they have the Pro version of Malwarebytes Anti-Malware...it's simply the BEST protection available to the masses that don't want to hassle with regular maintenance! Here we go again ... which anti-virus or anti-malware tool is the best. There is no "best" product. If there was such a thing we'd all be using it! Real simple solution. Use whatever works best for your personal computing habits. I've tried several over the years, both free and not so free. Loved Norton's and McAffee, but hated the way they took over everything. The free ones mostly didn't tell me anything about what they were doing. I'm the type who likes to hover around watching the mechanic work on my car, in hopes of learning something. Same with my computer and toaster. Used to have a couple great repair and tweak programs, but they were not compatible with newer OS's. I now have Iolo's System Mechanic and it comes with a "System Shield" anti virus. So I took the package. I don't know how System Shield stacks up against others, but I love System Mechanic so until the subscription expires, I'm happy with the combination. I have used the FREE versions of AVG, avast!, CCleaner, Malwarebytes, Glary Utilities and several other programs, that have literally gone, by the wayside and are no longer in existence. In this past year, I have decided to purchase the "Pro or Paid" program, of my favorite protection programs. First reason being ... I too ... Downloaded an "update/upgrade" to one of my favorite FREE versions, from CNET ... Need I say more??? I got the Conduit and Sweet Packs "crap" on my PC!!! It took me well over a month, to get rid of all that these 2 crapwares, installed on my PC!!! I also, had to "clean up" my daughter's PC, by remote control, for the same reason ... Trying to download avast! 's FREE version, from CNET. Something, I don't wish upon anybody. Not only do I BLAME CNET ... But, also ... ALL of the software companies, that are still using CNET for their customers who download the FREE version, and are only directed to CNET!!! This means AVG, avast! and so many, many others ... It just sickens me. Even though, I am using the PAID version of avast! ... Which does NOT use CNET, to download the PAID version of avast ... I am not happy, with this company, for "duping" their possible, future customers. Same goes for AVG and ALL other companies, who choose to use the CNET Download.com website, for their FREE versions and thereby "punish" those, who do NOT purchase, their PAID versions. We Geeks, know what websites to go to, for downloading these days, filehippo.com or filepume.com or majorgeeks.com or soft32.com or tucows.com or softpedia.com ... I have found that all of the mentioned websites, to be safe from malware, spyware, hijackware, viruses and etc. Because of Conduit and Sweet Packs "hijacking" my PC and trying to take over ... I am now, using the PAID versions of my favorite protection programs, avast!, CCleaner, Malwarebytes, Glary Utilities!!! Second reason, for the PAID version ... I can schedule these programs, which is not always possible with the FREE version, to scan and/or monitor my PC. In the FREE versions, you usually have to manually start the program, to do what it does best, scan for stuff, that does NOT belong on your PC or Laptop. It has taken me over 14 years, to go from the FREE versions to the PAID versions, but, I am glad that I did. Plus, the programs that I am using are low in cost and cost-effective, in the long run. I thank Bob Rankin, for keeping me informed of what I need to know, for protection of my PC, as well as family members and friends PCs. Bob has also, informed us of the prices of recommended programs or programs that are "new". This fact alone, gives all of Bob's readers, a big advantage ... We know, what to expect and how much it will cost us, should we choose to use, what he recommends. I am two years with paid Bit Defender and could not be more pleased. I click on anything and everything and never have a problem. Do what Bit Defender tells you to do. I have it on three computers running 7 pro. I do have CCleaner and MB. but have not seen anything. I agree with Ben in that there is no 'best' product but this sure works for me. In closing, Bob, keep up the good work, I read you faithfully. I started using Avast free version about 8 - 10 years ago. I had some problems so I upgraded to the paid version about 6 years ago. Last year with the most expensive Avast product my system was hacked and hacked again, and I lost about 500GB of data because my backup system didn't work properly. I'm still trying to recover that data, but may never be able to get it back. I noticed over the last few years Avast started breaking out some of the features that had been part of the package in past years and was charging more to get those products. I finally said sc**w it and this year bought PCMatic. At the time I purchased it I was able to get a great deal. I paid $25 for 5 computers. Then PCMatic ran a promo and I extended my package by 2 months by posting a link on Facebook and Twitter. I have found that with PC Matic I have not had any serious issues. The few problems I ran into were solved by either running the scan a few times or contacting the PC Pitstop crew and getting help from them. I'm curious as to why I haven't seen any mention of PC Matic in Bob's talks about any virus / firewall software. I have used BitDefender for well over four years and have never had a problem with malware. The only issue I have experienced was an incompatibility with some other software but nothing major. I use the Family edition on 3 PCs for $49.00 annually. In addition, I use Malwarebytes and CCleaner. In the past, I have used AVG, Avast, Avira, and Norton. I also use PC Matic and have not had any problems. Bob, have you tried PC Matic? I would like your comments.